Text based on The Smoky Hill Trail by Margaret Long, 1953. Written by Clarice Crowle, 1975, for the Smoky Hill High School dedication. 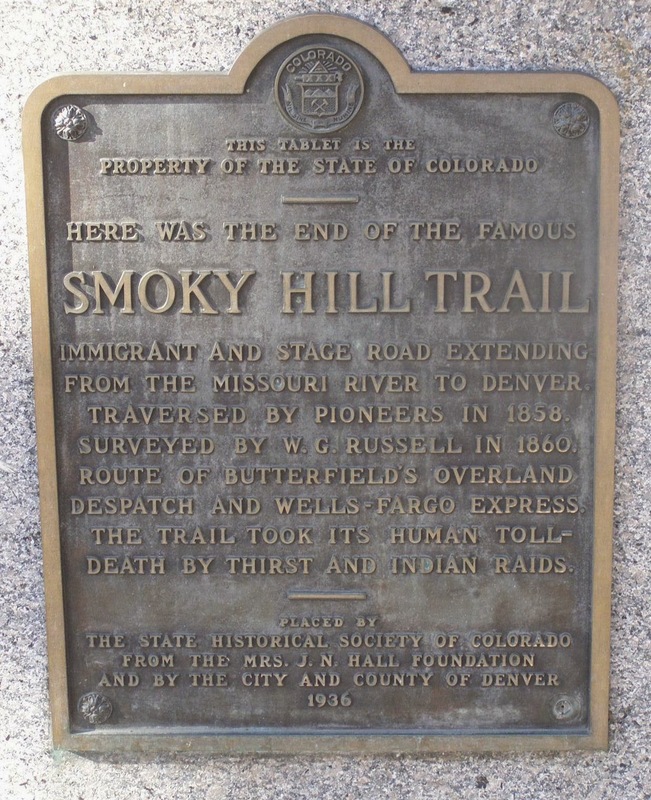 Originally an age-old Indian trail along the Smoky Hill River traversing Kansas, the Smoky Hill Trail became an emigrant "highway" in 1859 when news of the discovery of gold in Colorado (Kansas Territory at the time) reached Kansas City. Ten years earlier, California bound '49ers had turned either north (Oregon Trail) or south (Santa Fe Trail) to avoid the high barriers of the Colorado Rockies. The Smoky Hill Trail was virtually unused for that western migration. With the discovery of gold east of the Rockies, cutoff routes were made to Denver from both the Oregon and the Santa Fe Trails, but the main flow of the '59 gold rush was over the most direct route, the Smoky Hill Trail. Due to the scarcity of water and the danger of Indian attacks, it was by far the hardest and most dangerous of the three great prairie trails from the Missouri River to the Rockies. The name of Smoky Hill Trail is believed to be derived from the isolated buttes located within the great bend of the Smoky Hill River near Abilene, Kansas. It is recorded that these landmarks could be seen from a great distance through an atmosphere frequently hazy with smoke. 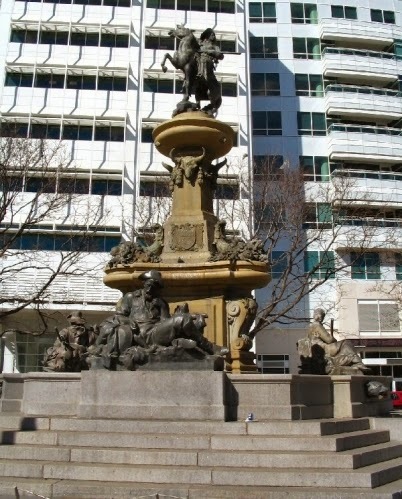 Thousands traveled to the gold fields between 1859 and 1865. Others came as soldiers, pioneers, and homesteaders. The earliest reference to the Smoky Hill River goes back to 1793 when Pedro Vial recorded in his log that coming from St. Louis he ascended the Smoky Hill River and then turned southwest to the Arkansas enroute to Santa Fe. Lt. Pike referred to it in his log recorded in 1806. Interestingly, the word Kansas or Kaw is the name of an Indian tribe and means Smoky. 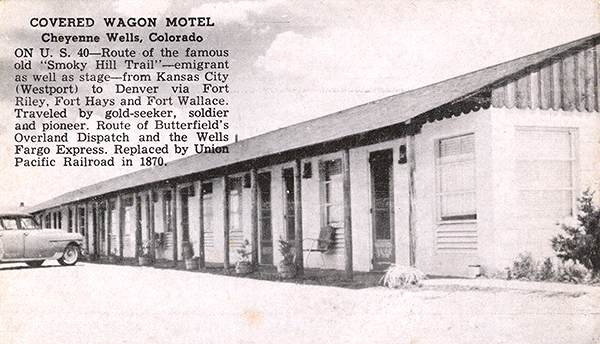 The Smoky Hill Trail emigrants outfitted in Leavenworth, Kansas City, Abilene, or Salina and followed the Smoky Hill River to its headwater in southeast Colorado, near Old Cheyenne Wells. Here the Trail divided into the North Smoky, which took a cutoff to Hugo, and the South Smoky which followed Big Sandy Creek to Hugo. They continued on the same route to Lake (just south of Limon) at which point the North Smoky continued on a route similar to present U.S. 40 through Buick (Bueck), coming into Denver from the east while the South Smoky took a more western route to present Kiowa and then northwest to Parker and Denver. Along this route were built the Mile Houses-20 being at Parker, 17 just north of the Arapahoe-Douglas County line, and continuing on into Denver were the 12, 9, 7, and 4 Mile Houses. The third section of the Smoky Hill Trail in Colorado was the fateful Middle Smoky Hill Trail, often called the "Starvation Trail." It was a direct western cutoff from the North Smoky near present Buick to the Kiowa Creek crossing and then a northwest route to Denver, meeting the South Smoky near present Quincy Avenue. The Smoky Hill Road of today, on which Smoky Hill High School is being built, runs on the ridge of Sampson Gulch and coincides very closely with the Starvation Trail. It gained this nickname because so many people died on this route. They came in covered wagons and on foot, even with pushcarts and wheelbarrows. They were poorly equipped and scantily fed, and they faced the chilling winds, and the snow and mud of early spring in their eagerness to reach the gold fields. This route was lined with abandoned property, broken wagons, dead horses, and many unmarked graves. They had met hostile Indians and had run out of water. Many of the creeks were dry, and when they did find water they could not carry a long-lasting supply. The legends about the Smoky Hill Trail and about the pioneers who used it have survived, but the trails over which the pushcarts and the prairie schooners toiled are rapidly being replaced by ribbons of oiled highways. Historical societies have done a gallant job of preserving and marking areas of particular interest. It is a challenge to try to preserve the Smoky Hill Trail in order to pass on to posterity not only the legends but also the visible evidence of bygone days. Thank you for a great article. It is sad to see that our rich history is disappearing due to new housing and many of the markers and history since this article was written have been burned down to bring in new developments. One being the Eleven Mile House across from Grandview High School. Thank you for the well written article and website. We hope you will consider visiting Smokyhillbound.com for up to date info and come over to talk to your neighbors about the area.